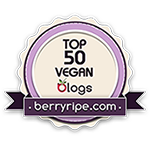 Green Vegan Living: Happy Pi Day! Wow, this is the first year I've had my s**t together enough to get a post to you about pie ON Pi Day! I'm pretty proud (and excited) right now. So, happy Pi Day to you! If you don't know what that means, it's the day when nerdy folks (or people who just like a reason to celebrate) enjoy a tasty treat shaped like a pie. The date is 3/14 (the first three numbers of the mathematical number pi). And today I have a special and delicious double review for you today, in honor of Pi Day. I'm a bit embarrassed by how long it took me to write about these two products*, but just wait until next week, when I review something that's been been sitting around my house even longer. I guess that's just what a hectic school schedule will do to a girl, hmmm? And right now, I should actually be studying for my finals (they are next Monday - woohoo! Then it's spring break! ), but instead I'm doing this! Hoorah for distractions. I'm combining the reviews into one because I'm just that awesome, and also: Pi Day deserves a little extra treat from all of us! 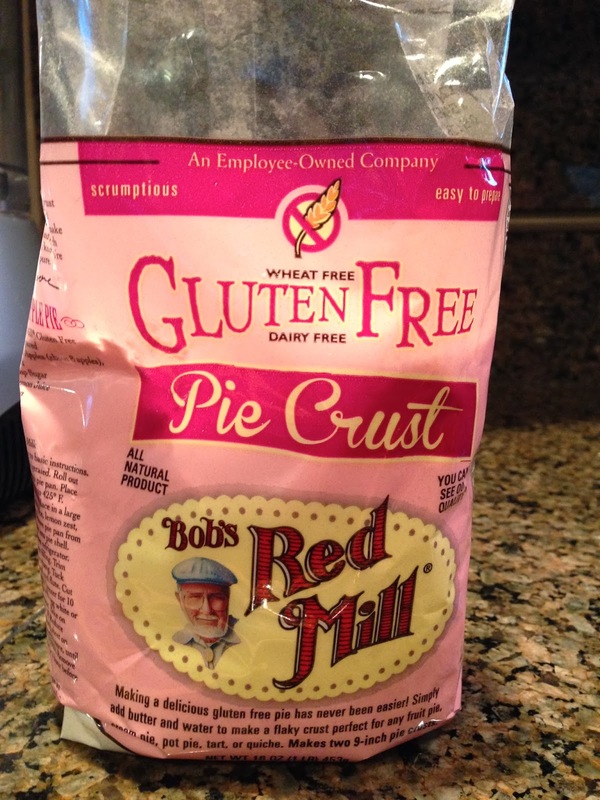 Today I'll be talking about Bob's Red Mill brand-new gluten-free pie crust mix as well as Dynise Balcavage's newest cookbook, Pies and Tarts with Heart. Being the genius I am, I decided to combine the reviews by trying out the crust from Bob's and trying out a pie filling from the cookbook. The thing I like about the cookbook is that there are a few different varieties of gluten-free crusts, so had I not already had a crust in mind, I could have easily put together one from the book. However, since I was so eager to try out the brand new crust mix, I chose to forego the recipes this time and try them another time. 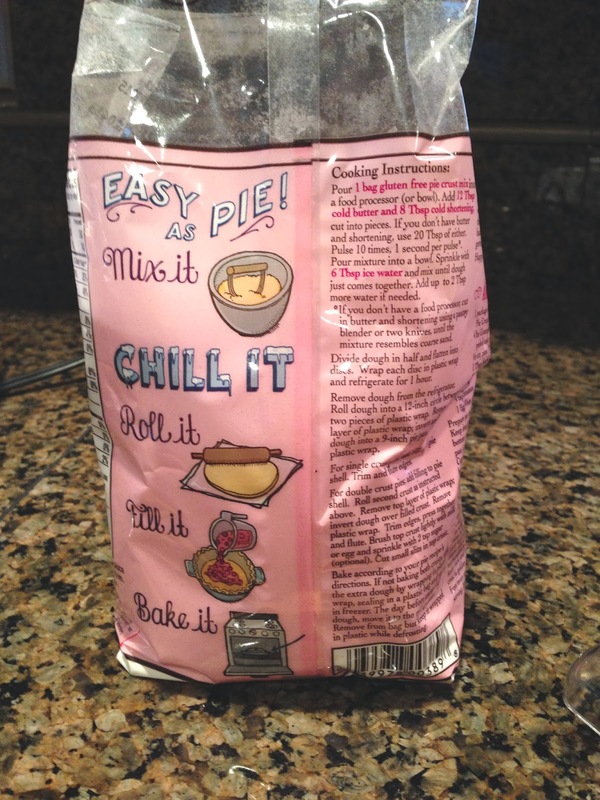 The crust mix is extremely easy to make. As you can see in the picture above, the instructions are very clear and even include alternate ways of preparation (no butter? use this! no food processor? do this!). I appreciated that, and used some Earth Balance Coconut Buttery Spread instead of the butter that is called for. First, I processed the crust mix and "butter". Easy peasy. Next, I added cold water and mixed the dough with my hands. Then, I patted it into a disc. I refrigerated the disk (there are actually two) for one hour, then rolled it out. I used my trusty plastic wrap rolling technique, which worked like a charm. Finally, I laid the dough into the pie pan and pressed it into place. I was amazed by how well the dough worked in this step, unlike many gluten-free doughs I've made in the past. There was hardly any tearing, and the dough actually (kinda, sorta) stretched as I pushed it into place! Whoa! As for the filling that I chose from the cookbook, I decided on apple pie because it seemed the most seasonally-appropriate. Although we're bordering on spring, I don't think any fruits are currently ripening in Portland, so I chose to use the always-sturdy and -dependable apple. I used 1/2 cup less sugar than was called for, and I substituted plain old water for the non-dairy milk in the recipe, but otherwise, I made everything step by step. 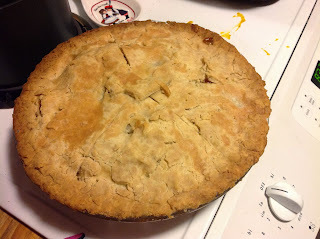 I was amazed yet again by how easily the pie crust traveled from my cutting board to the top of the pie. It was almost like I was 6 years younger, using a crust made with whole wheat flour. Finally, after what seemed like forEVER (not really, but when you're looking forward to pie, it can seem like a lifetime), the pie was baked and barely cooled and I was putting it into my belly! My overall review is this: this pie crust is aMAZing. Go get some. It isn't super flavorful by itself, but when mixed together with filling, it's divine. And the crust works like a piece of glutenous magic. I'm serious; go get some. And this cookbook is fantastic, as well. Now that I've browsed through it more than once, I can't wait to try even more recipes from it, especially if each of them turn out as good as this one did. And since we're speaking of pies, here's a tasty pie I made from Jennifer Katzinger's cookbook, Gluten-Free and Vegan Pie, and never showed you (I had planned to write a review of that book, but since it was published a looong time ago, I'll just leave it as: it's a good book, and you should check it out. ).